Since Wechat has shut down a popular feature that allows users to tip content creator so as to comply with Apple’s policy on in-app purchase, many Chinese people have tended to buy Android phones. Among Android phones, Samsung Note has won great popularity for its excellent performance. For users who change to Samsung Note phone, they all encountered the same question: how to transfer contacts from iPhone to Samsung Note 5. We’re going to explain how to make contacts transfer iPhone to Galaxy Note. 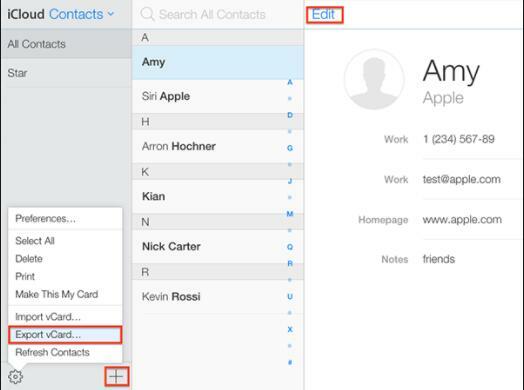 How to make contacts transfer iPhone to Galaxy Note? 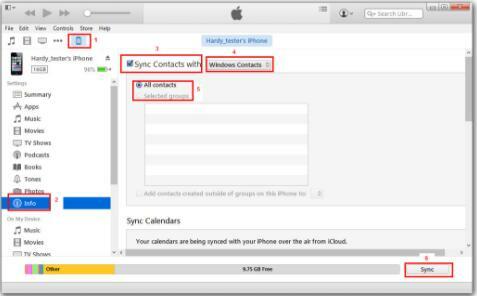 The simplest way to get contacts transfer iPhone to Galaxy Note is iCloud. 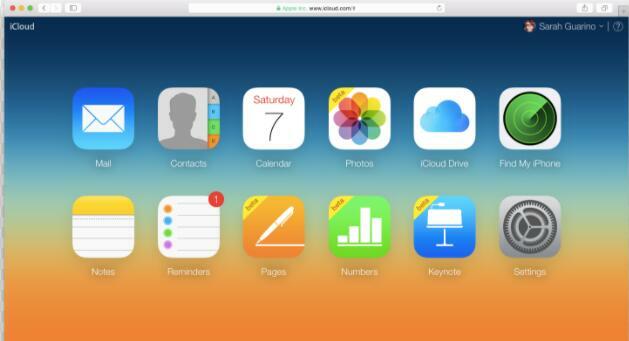 iCloud is a wonderful application to back up iPhone contacts, mail, images, etc. in a secure way. It can also automatically update those files in time across all your devices. Hence, whenever and wherever you want to check those files, you can get them in a few seconds. Now let’s take a look at how to transfer contacts from to Samsung Note 5 via iCloud. 1. Enter iCloud website: https://www.icloud.com/ and log in iCloud with your Apple account and password. 2. Go to Contacts and click the gear icon at bottom left to choose "Select All", then click it again to choose "Export vCard". A box will pop up to ask you to choose output directory. You can browse computer folder to select the target output directory. 3. After you export those files, connect your Galaxy Note to computer via USB cable. Paste the .vcf file to the root folder of Galaxy Note 5.
iTunes is another wonderful gadget that enables Apple users to enjoy a wide range of music. Except for this useful function, it also allows people to transfer iPhone contacts to Samsung Note via syncing. The detailed steps how we transfer iPhone contacts from iPhone to Samsung Note 5 are displayed as the below. 1. 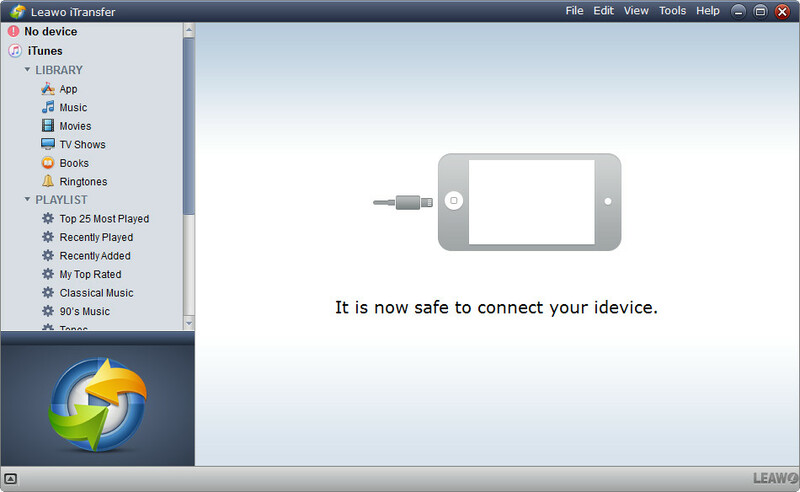 Connect iPhone to computer via USB cable and open iTunes on computer, iPhone can be automatically detected by iTunes. 2. 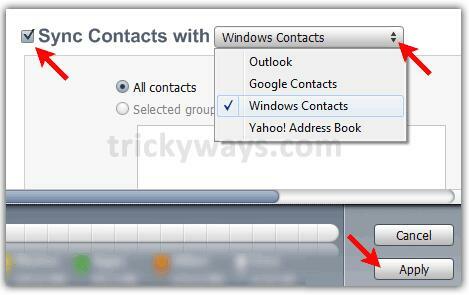 Click "Info" on the navigation menu, then check "Sync Contacts With" and choose "Google Contacts" in the drop-down list. 3. Register Google account and click "Apply" to allow iTunes to sync contacts with Google account. 4. Open Settings > Accounts on Samsung Galaxy Note 5 and log in with Google account, then contacts will be there. Now, you complete to transfer contacts from iPhone to Samsung Note. Leawo iTransfer is able to transfer various files including contacts, ringtones, photos, videos, etc. between iTunes, iPhone, iPad and PCs. The interface of the software is intuitive and clear to enable users to transfer files in an easy and fast way. Furthermore, it can effectively back up data from iPhone to computer and iTunes, which guarantees the safety of your iPhone data. To transfer contacts to Samsung Note, Leawo iTransfer is a good choice you can’t miss. Download and install this iTransfer on your computer. The below steps would show you how to transfer contacts from iPhone to Samsung Note with Leawo iTransfer. Use USB cable to connect iPhone and computer and then open the software. Your iPhone will be automatically detected by the software. Head to iPhone > Library > Contacts and check all contacts right before the contacts name, then right click one of contacts and choose "Transfer to > My Computer". A box will pop up to ask you to choose the output directory. After that, click "Transfer Now". Remember not to stop transferring. Now contacts from iPhone are saved on computer. Connect your Samsung Galaxy Note to computer via USB cable and start to transfer contacts to Galaxy Note. You can simply copy contacts on computer and paste them to Galaxy Note. 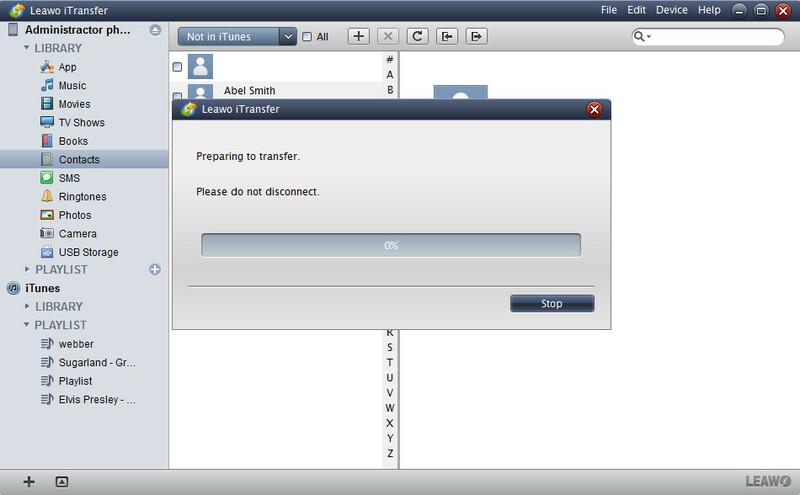 If you’re using a Mac computer, you could make use of Leawo iTransfer for Mac to transfer vCard contacts to iPhone on Mac. When you don’t have USB cable at hand and you need to make contacts transfer iPhone to computer, you can transfer iPhone contacts to Galaxy Note via e-mail. How to make contacts transfer iPhone to Galaxy Note? You can read the following steps. 1. Go to iPhone Settings > iCloud > Backup to toggle on backup option. 2. Log in iCloud website on computer and go to Contacts. 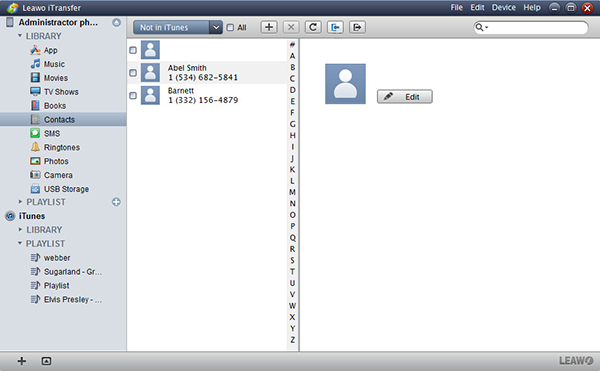 Click the first and last contact name in the right interface and hold "Shift" to select all contacts. Click gear icon again to choose "Export vCard" to the target output directory. 3. Enter gmail.com with the same Gmail account you use on Samsung Note. Then go to Contacts from drop-down menu. 4. Click "More" to select Import to import VCF file downloaded from iCloud. 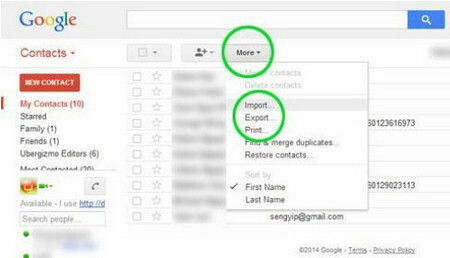 In this way, Gmail will automatically sync contacts with Samsung Note.